Does Xbox 360 Play Blu-ray Discs? Does Xbox 360 play Blu-ray discs? This is a question that a lot of Xbox 360 owners have. Unfortunately, the answer is no. Both the Sony Playstation 3 and the Xbox 360 were announced during the format war between Blu-ray and HD DVD. As Sony is one of the inventors of Blu-ray, it’s natural that the PS3 will side with Blu-ray. And naturally, Microsoft chose to side with HD DVD and that’s why the Xbox 360 had a HD DVD drive instead of a Blu-ray drive. And the HD DVD drive on Xbox 360 doesn’t support playback of Blu-ray drives, so you can’t play Blu-ray on Xbox 360. Next time when you have a friend who owns an Xbox 360 and asks: can I play Blu-ray on Xbox 360, tell them no and let them know why. Which one of the Xbox console support Blu-ray? As Blu-ray turned out to be the winner of the format war, HD DVD had started to disappear from the public and Blu-ray became mainstream. And there’s no reason for Microsoft to stick with HD DVD. So they started to put a Blu-ray drive in the next generation of Xbox, the Xbox One. You can find a Blu-ray drive in the Xbox One just like its competitor, the PS4. So to confirm, does Xbox 360 play Blu-ray discs? No, the Xbox console that you can find a Blu-ray drive are the consoles that came out after the Xbox One(Including Xbox One). The Xbox One S even went further to support playback of 4K Blu-ray discs, which is a feature you can find lacking in the PS4 lineup. Since the disc drive in Xbox 360 doesn’t support Blu-ray disc, is it totally impossible to play Blu-ray on Xbox 360? Actually, there are ways for you to enjoy Blu-ray on it, you’ll just have to go a few extra miles. As you know, Xbox 360 can play videos from USB drives and other external storage devices, so as long as you can convert the Blu-ray movies to a format that’s supported by the Xbox 360, you’d be able to enjoy the movie on it. The formats that Xbox 360 supports include: MP4, M4V, MP4V and MOV. So all you need to do is find a proper Blu-ray ripper that can help you convert Blu-ray to MP4 or other supported formats. You can find all kinds of Blu-ray rippers out there, but it’s not easy to find a good one. Here’s one that’s been getting positive reviews from users: Leawo Blu-ray Ripper. It can rip and convert protected Blu-ray to common video and audio files for playback on different devices. It supports a lot of different formats, including the 4 formats that the Xbox 360 supports. The biggest attraction of the program is its ability to rip Blu-ray to lossless MKV. 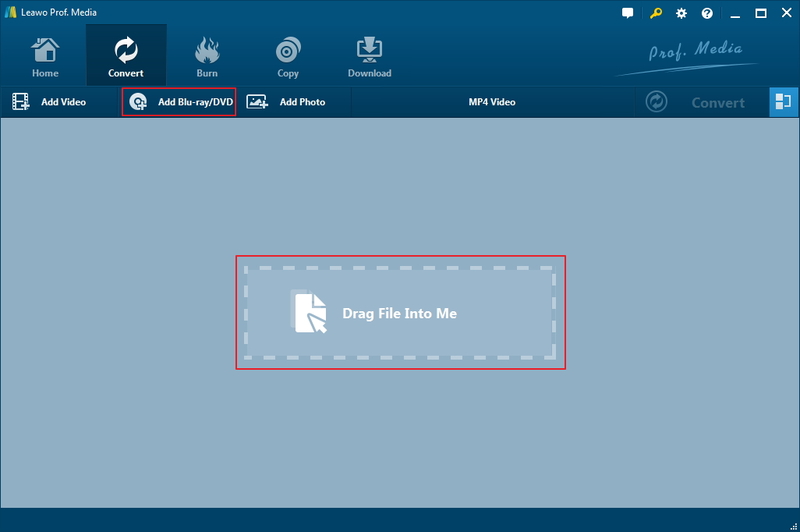 But as we are converting the Blu-ray to MP4, we won’t be using this feature in this post. But you can try it by yourself if you are interested. Here I would show you how to rip Blu-ray to MP4 to play on Xbox 360. Many software company started to pack some of its products together inside one software suite, and that’s also the case here with Leawo Blu-ray Ripper. It’s now a module inside Leawo’s Prof.Media. 1. To start with, put the Blu-ray disc in your Blu-ray drive and open Leawo Prof.Media. There are two ways of launching Leawo Blu-ray Ripper. The first way is click the Convert button on the top row of buttons in the top left corner. The second way is to click the Blu-ray Ripper tab on the interface. 2. The main interface of Blu-ray Ripper is fairly simple. There’s the Drag Files Into Me sign in the center telling you to drag the source Blu-ray files to it. You can directly drag the Blu-ray folder to the program to add the source Blu-ray files to it. You can also find an Add Blu-ray/DVD button above the blank area. 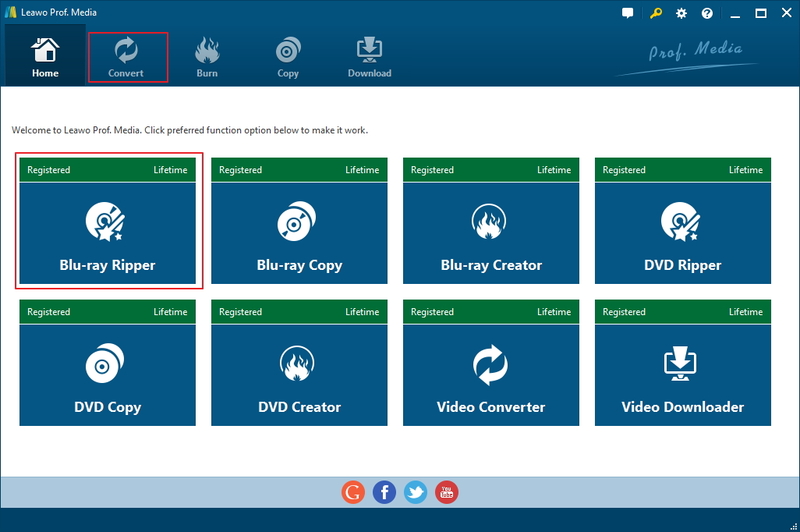 Click on it and choose Add from CD-ROM and select your Blu-ray disc on the following menu. All the media files in the disc will start to be imported to the program. 3. Usually there will be different videos in the disc other than the main movie. Chances are you don’t need all the videos, and you don’t have to rip all of them if you don’t want to. The program does offer you with 3 different options to choose different videos for ripping. If you do want to rip all the videos in the disc, just click the Full Movie button to select all the videos. Choose Main Movie button to rip the main movie. And you can use Custom Mode to the videos you need freely. After making the decision, click OK to confirm your choice so that the chosen videos can be added to the ripping list for other settings. 4. We haven’t choose an output format for the videos yet, and that’s what we are doing in this step. As is mentioned before, the Xbox 360 supports 4 different formats, we can choose one format to convert the Blu-ray movies into. To choose a format, click the Format button. On the format button you can see the current output format, and it’s MP4 video by default. You can click on it and click Change to reset the format. 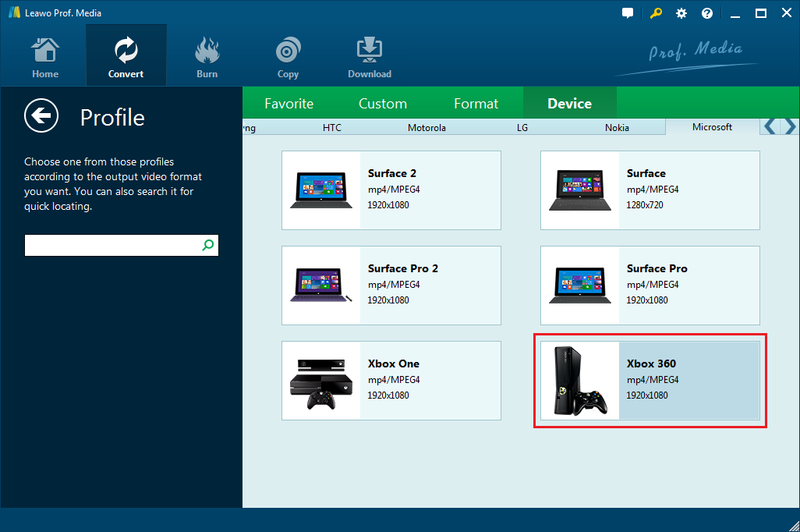 You can go to Device>Microsoft and select the format designed specifically for the Xbox 360. 5. Lastly, click the convert button and set the output path for the videos you are ripping on the sidebar that follows. And start to rip the Blu-ray disc by clicking the Convert button at the bottom. When the program finishes ripping videos off the Blu-ray disc, you can transfer the converted MP4 videos to your flash drive and play the videos with your XBox 360.